The Thursday before I had been part of a panel discussion titled “War and Peace: Connecting the Dots,” the first in a series of informal “think tank” sessions sponsored by the Socially Responsible Network, a network of over 200 community-based organizations in Oakland and the surrounding East Bay. Aimee Allison, a Gulf War veteran currently doing counter-recruitment work (and a candidate for the Oakland city council) expressed reservations about the constant round of rallies that have been a main focus of organizing against the war, and argued for putting more resources into face to face organizing efforts, and particularly into counter-recruitment and support for the growing number of people in the military who also oppose the war. This sparked a broader discussion about organizing approaches, ranging from the usefulness of mass rallies in big cities to the recent emphasis on coming up with a “progressive” version of right-wing “public relations” (i.e. propaganda) strategies. I too have long had doubts about the emphasis placed on big rallies in big cities, not just in the current anti-war movement but in other organizing efforts of the past decade or so. 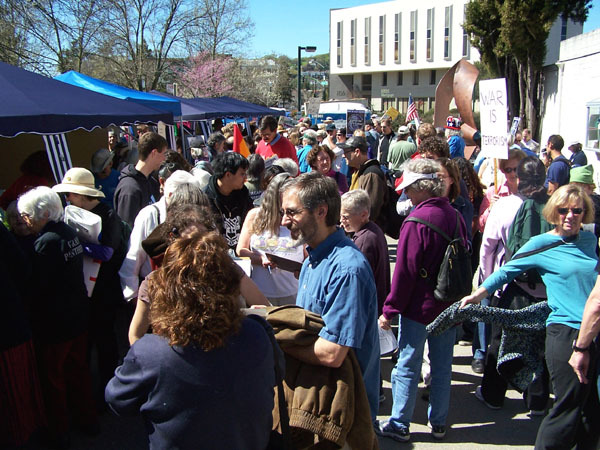 These events cost relatively large amounts of money– in the case of big urban mobilizations, sometimes tens of thousands of dollars or more– and often occupy a large portion of the time of both local groups at the event site and what staffed offices there are of national networks. For most who attend, they too often are like a consumer event, a life-style choice, like going to a concert or a movie: show up, be entertained by celebrities of one kind or another, go home. Part of this is a question of location and scale, and in this the decision of United for Peace and Justice to support decentralized local and regional actions this time around seems to me to have been a good choice. 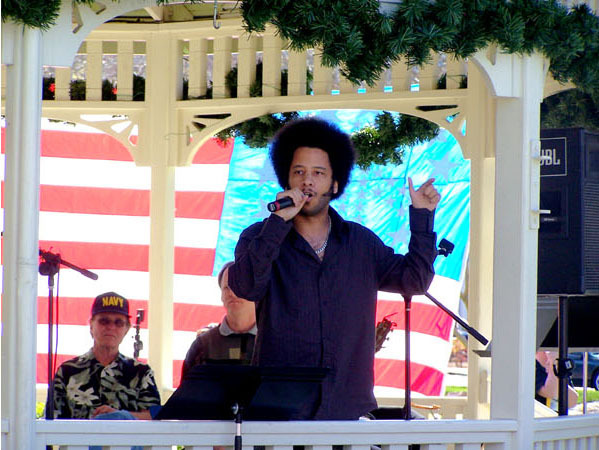 My early experiences with organizing– and with events like rallies– were as a high school student in a small city in upstate New York during the Vietnam War years. An anti-war demonstration there in those times provided solidarity in a largely hostile community in a way that was quite concrete– you would likely see which of your classmates or teachers or local business people were against the war; the scale was small enough that you would recognize them. At this scale, the rally experience also tends to make for more horizontal connections: people talk more to one another, and maybe even make arrangements to work together in the future. 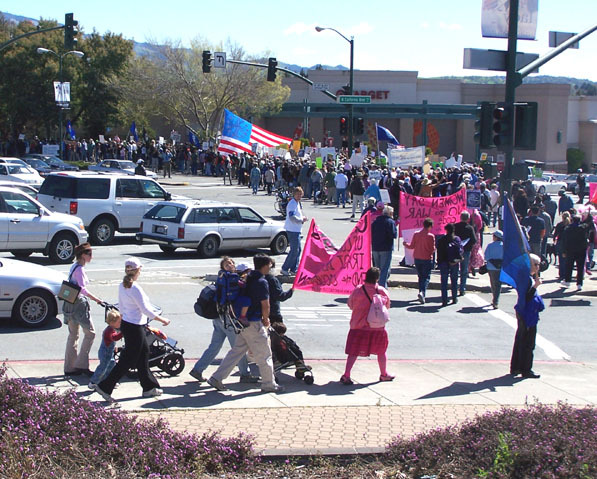 The Walnut Creek rally had that feel to it, mainly due to scale rather than location, since a number of people from San Francisco and elsewhere chose it over the closer, larger San Francisco event the same day. I had conversations with people I hadn’t seen in months, arranged to speak at a local group, argued electoral strategies with a local elected official who was an invited speaker. At a mass event in a big city, chances are none of these things would have happened. I would have arrived and left with the same people, maybe run into a few other friends or acquaintances by chance. At the panel discussion in Oakland before the weekend of Iraq War actions, the objections (which came, interestingly, mainly from younger people) to de-emphasizing large demonstrations boiled down to the argument that they are visible in the mass media, particularly television. The media images of past social movements give us mainly the peak moments, the huge marches and rallies and climactic moments of resistance in great cities. This has led many, I think, to try to recreate these images, and, in a media-dominated age, to a confusion of where the power of those movements came from. It is easy to think that the power comes from having enough people to be “newsworthy,” to create vivid images like those we see in film of movements past. And so we have something of a culture of the “floating demonstration,” with a great deal of emphasis placed on organizing periodic large, mediagenic gatherings in major cities. But in movements of the past here in the United States that had some success, the huge demonstrations in capitol cities were not the iceberg, but only its tip– often accompanied by millions more people organizing and working together in cities and towns across the country. This is still true to some degree (as last weekend’s actions attest), but I believe less so than even a few decades ago. In the end, demonstrations, whether large or small should not be the main focus of our efforts. Demonstrations can be spontaneous outpourings in response to a crisis: this kind is relatively easy to organize when conditions are right, but by themselves seldom lead to sustained movements for social change. 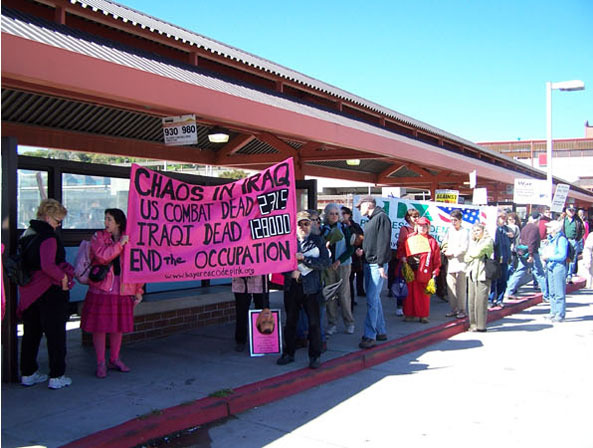 I have spoken to several young people whose first experience of organizing was in the run up to the 2003 Iraq invasion; they were dismayed and at a loss when much of the mobilized opposition seemed to vanish once the war began, but this is not an unusual pattern. Demonstrations also can be “demonstrations” of the social power of a movement that has been constructed over a long period of time. Too often it seems to me now that we are trying to create the image of this without the long hard work of building the substance. We live today in an anomic society, where many of the institutions that have in the past sustained communities, and communities of resistance, have been eroded. There is a particular need to build again local groups, institutions, and coalitions that can survive and grow over long periods of time. Human scale forms of organizing are important not only because they are the path to building social movements broad and deep enough to sustain the real social transformation we will need, but also because the huge organizations that dominate the form of modernity we have made, and the prevalence of anonymous, passive social experiences and transactions have destroyed or supplanted most human scale groups, institutions, and interactions. Rather than putting energy into chasing media and mediagenic events, we should be looking for opportunities to speak and interact in face to face settings– classrooms, churches, social and professional organizations, to the largest extent possible outside our “normal” haunts. In the San Francisco Bay Area, a disproportionate share of the “progressive” events take place in a few zip codes in Berkeley, Oakland, and San Francisco. But even more important, we need to build again independent local institutions and coalitions that can survive and grow over long periods of time. At the most prosaic level, they provide on-the ground-infrastructure: offices where meetings can be held, phones and copying machines, staff people who can take on the tasks of coordinating emerging coalitions. Further, the trust and understanding necessary to bring together the elements of a diverse oppositional culture are more likely to develop in the course of organizing around concrete issues that affect people where they work and live than by periodic rallies featuring a laundry list of issues. 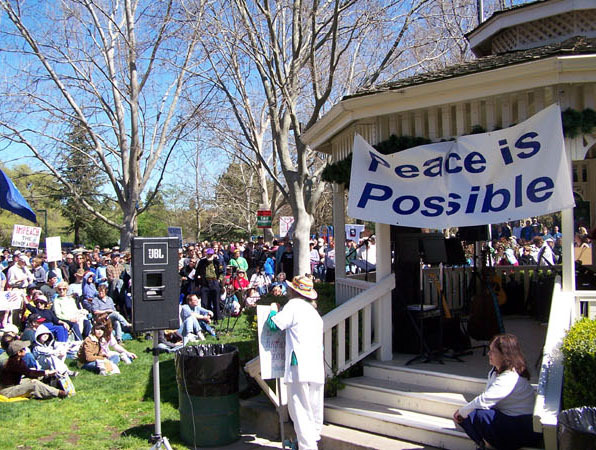 In my experience, effective multi-issue coalitions and longer lasting cross-issue working relationships in “peace movement” work have been built mainly through local or regional campaigns that connected different issues– for example, stopping military projects whose regional impacts manifested the pervasive effects of a militarized economy on everything from the environment to labor conditions. But in addition, local organizations provide places where we can find solidarity and mutual support, and where we can develop the skills and everyday habits and attitudes of making decisions and working together in an equitable way, are the basis for any genuine democracy. Without these human scale experiences and social settings, places where in times of crisis they can turn for support and information they can trust, individuals in a mass society are easy prey for the manipulative, top-down techniques of propaganda, techniques that planfully exploit our fear and our isolation. How we do things is as important as what we say we believe. As Franz Neumann noted in Behemoth, his study of the Nazi state, the propaganda of the anti-democratic Right cannot be defeated by a “democratic super-propaganda.” Every time we spin a “sound bite” aimed at using the means of mass communication to evoke a visceral reaction, every time we organize an event that exploits the image of a celebrity that has been created as a commodity for profit, we reinforce social patterns of passivity, hierarchy, life as television to be watched or corporate-made things to be consumed. Every time we really do something with people, really try to make a human connection, talk to people face to face, try to build our own skills and those of our colleagues and allies and to create organizations we truly own, we do a little to keep another kind of world possible. Well said, Andy. Building community, understanding and connection is vital to creating sustained resistance and positive alternatives, rather than merely reacting to all the bad stuff the corporate war machine concocts, and also to overcoming the fear, isolation and social atomization the war machine counts on to keep us from realizing our power. This is important to keep in mind as we experience the inevitable ebb and flow movements always encounter. 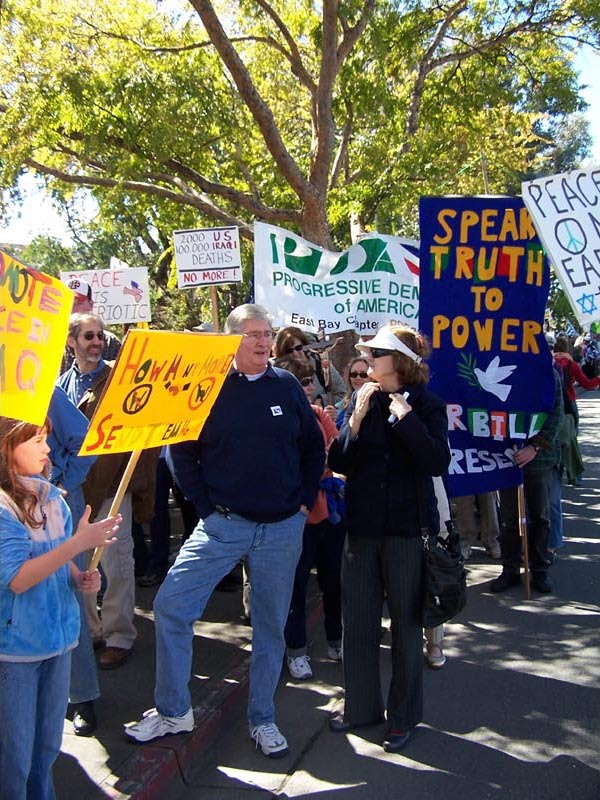 Some in the peace movement are concerned that, although public opposition to the war and Bush’s policies is growing, our numbers “in the streets” are not. We shouldn’t be alarmed at this, but should analyze what we need to do to build “the beloved community” as Dr. King spoke of, at the local, national and global levels. A related, minor aside: in New York City, activists often talk about getting ads or op-eds into the NY Times. I say in response, think about getting them into major papers in Florida, or Texas, or Colorado, or elsewhere in the country, not just NYC (or DC, SF, Boston). It’s a big country.